At some point in our lives, we will need some form of financial help and finding the right one might be harder than you think. For one, it requires that you have to acknowledge that you need help. It seems so trivial but a lot of consumers deny the fact that they are at a point in their finances where they already need help. Denial will only prolong the problem as well as compound the negative effects it has on your finances. This is why the sooner you accept the fact that you need help, the sooner you can look for help. The next struggle is finding the right type of help you need for your particular situation. There are times when you simply need some help in monitoring your budget but at times, you already need professional intervention. What can bring you debt problems? One of the things that you need to know is that debt does not happen overnight. Unless you have decided to gamble and lose everything you have in a day, chances are your debt has been accumulating for quite some time. 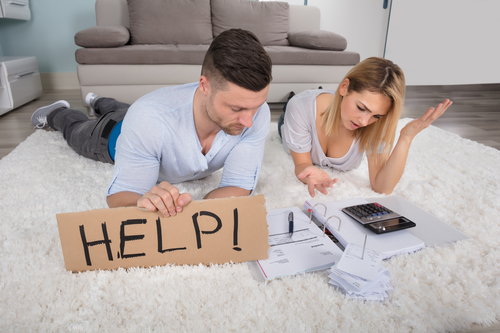 Here are some of the most common culprits why you are in debt and in need of financial help. There are times when your spending habits are the culprit of accumulating debt. This might have reflected with the 5.9% increase in spending from last year according to CNN. You may not notice but you are already spending more than what you can pay for every month. As a result, you are unable to pay for the whole amount and left with balances on your account. This can lead to penalties and fees which increases your payments every month. You need to understand how you are spending your income every month. Are you spending more because out of need or habit? If it is the former, you need to budget better to make sure your income can cover your expenses. However, if you are overspending because of habit, you need to identify a reason why you should spend wisely. One thing that can work is setting your sights on your long-term goals. Credit card debt is one of the most common reasons why people are looking for financial help. This has resulted in a stigma around credit cards and how it is associated with debt. What you need to understand is that it is not about the credit cards but how you use it. This will define whether you will be in debt or if you get to take advantage of its benefits. One of the realizations you have to accept is that your credit card is not part of your income. Every single time you use it, you are taking out a short-term loan. You are charging that expense on your card by borrowing the money from your lender. Once you understand the mechanics of your credit card, you will be able to make informed decisions. This is one of the biggest reasons why you would be needing financial help at present. If you are unable to manage your debt payments properly, chances are you are missing a few of them. Once this happens, you will be paying a bigger amount the next time around because of penalties, fees, and other penalties slapped by your lender. Now that you have an idea why you might need some help with your finances, here are some of the places to look for them. When you need help with just about anything in life, the first group of people you approach is family. These can be your parents, siblings, close relatives, or even your spouse. They are the ones who would most likely have your back and help you without asking for anything in return. It is always a good idea to start with them. Your parents are a fine example of people who might be willing to give you a helping hand. One thing you need to remember when it comes to financial help is that it is not always about money. Your parents could be in a great position to help give you pieces of financial advice. This is because there is a big chance that they have already gone through some, if not most of your financial problems. Apart from family, you might have friends who can be a big help. These could be the ones you grew up with or even those that you have been with since school. They are the ones who know you and would not hesitate to call you out once they see you are making a mistake. They can help you get out of financial troubles but you need to remember that if they lend you money, you have to repay that amount. Your friends are also in a great position to call you out when you start to spiral out of control. Real friends are not afraid to call your attention and point out the wrong things you are doing. They can even give you advice on what your next steps are because they want you to succeed in life. Real friends delight in your success. You might not think that your bank is the go-to place for help when it comes to your finances but they can be a great source of sound advice. This is even better when you know the people in your bank. It might be a challenge now that almost everything is done online. But you can drop by and ask about the bank’s products which can help you manage your finances better. It can be anything from a bank loan to consolidate your debt payments to investments accounts to help you plan for your future. They might even be able to offer you online payments and transfers which can take the burden off of your shoulders to attend to each and every single one of your payments every month. Just look at what they have and see how it helps your current needs. One of the best decisions you can ever make in when you find yourself in need of financial support is looking for professional help. There are a number of companies out there who can help you take a look at your finances, identify the problem, and help you choose the best course of action based on your present financial situation and financial goals. Some of the debt repayment plans you can look into is debt consolidation and even debt settlement which can help you get ahead of your financial problems and debt payments. You will need financial help at some point in your life and the idea is to make sure you acknowledge the need and take it. Do not try to handle everything by yourself because you might end up making an even bigger problem that the one you began with. Look for help, know which ones you need to listen to, and follow through with action.